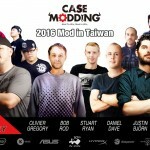 24.05.16 Taipei, Taiwan – For Computex 2016, CRYORIG is revealing their first foray into PC cases with two innovated and uncommon projects. 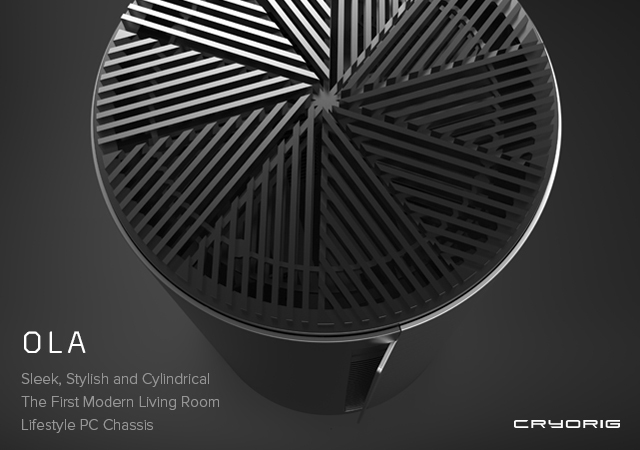 The CYORIG OLA is a Mac Pro inspired cylindrical home theater lifestyle ITX PC case with focus on performance and cooling. The CRYORIG TAKU is a monitor stand PC case that focuses on maximizing desk space while slides open for easy access to hardware. 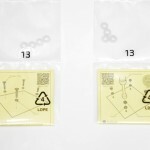 Both the OLA and TAKU projects are still in early development. CRYORIG is planning on a “Ask Anything” live stream event on June 1st during Computex for user feedback on both projects. 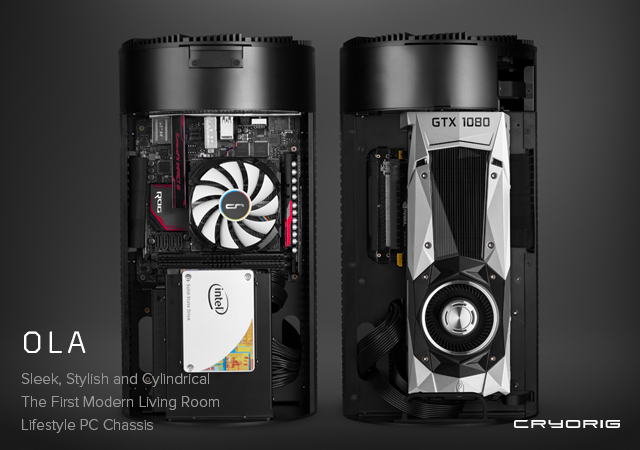 With the OLA, CRYORIG is attempting to create a PC experience case that not only looks sleek enough for it to be a center piece of the living room but also capable of housing powerful full length GPU’s. 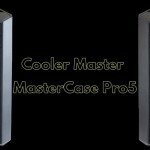 Inspired by the Mac Pro, the OLA is cylindrical with a purpose. With a Cylindrical shape the OLA achieves increased internal air volume, and zero airflow dead space. 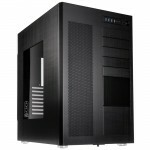 Individual compartments for the CPU, PSU and GPU prevents heat overflowing to other areas. Dual shark-gill like side air intake ducts run the length of the case to insure cool air intake for both the CPU/mainboard area and the GPU. The large 140 mm XT140 exhaust fan at the top pulls out all excess heat from both compartments. The OLA supports full length GPU cards as well as 100 watt TDP Core i7 CPU’s, perfect for the high computation needs of VR. On the aesthetics end, the OLA features a modular front and back panel for multiple textured options. Functioning units will be shown at Computex as well as static units with Brushed Aluminum and the Wood Veneer alternate panel texture options. The OLA is still work in progress with the release targeting Q2 of 2017. Full specifications are to be announced once designs are finalized. 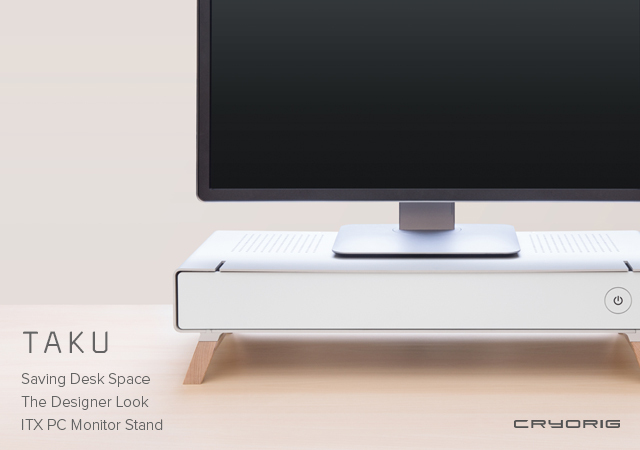 The CRYORIG TAKU is a combination of an ITX case and PC monitor stand. 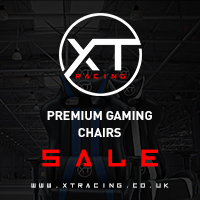 The TAKU is constructed with a 3 mm thick full aluminum chassis for optimum structural support while still maintaining a light weight. 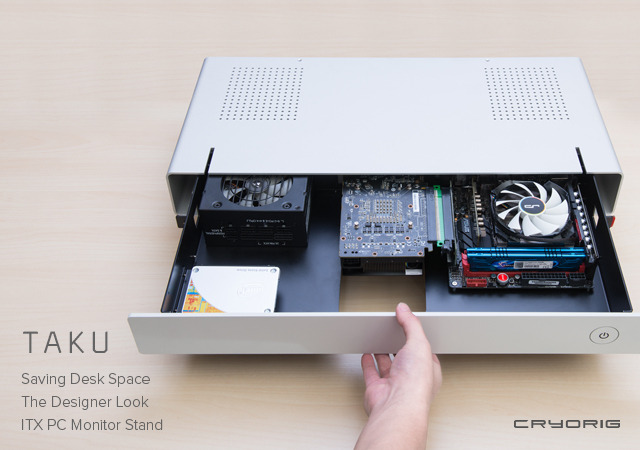 The TAKU’s internal system tray uses a sliding drawer design for easy access to the mainboard, GPU and HDD compartments. The TAKU also features thoughtful cable management ducts on both sides for USB power cords connecting to your mobile phone. 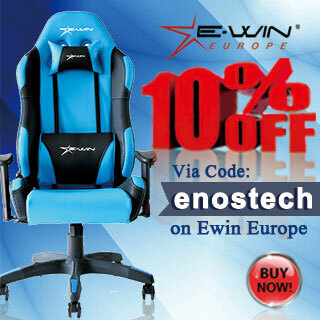 The OLA is designed to keep the desk clean and your PC even sleeker. 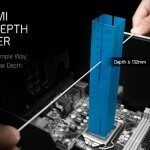 Support for 250 mm long GPU’s, drive bays for a 3.5” and 2.5” device or two 2.5” devices, suitable for most ITX system needs. In addition to the full aluminum frame, the TAKU also mixes in solid wood legs at the base for contrasting materials. Like the OLA the TAKU is also still a work in progress with targeted release dates in late 2016 or Q1 2017. 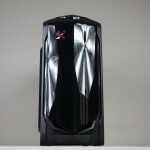 Functioning demos of the TAKU will be at display during Computex. Along with CRYORIG’s first two case projects, CRYORIG plans on airing the first ever live stream event directly during Computex. The live stream will focus on presenting the new products as well as holding an “Ask Anything” Q&A session as well as collecting feedback for in progress projects. The live stream event will be aired on CRYORIG’sYoutube Channel on June 1st at 9:15 AM (GMT+8). 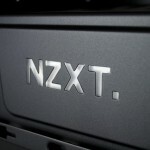 Please pay attention to CRYORIG.com for any changes in schedule.